With these questions in mind, Rob Johnson – former British Army officer and current lecturer in the history of war at Oxford University – sets out to examine twenty examples of bravery on the battlefield to look for the characteristics of success in war when situations might suggest there is no hope left. His interest lies as much in uncovering why it is that some surrender or break under pressure while others triumph and show extraordinary levels of courage, as it does in explaining the historical and tactical events in each of his case studies. The result is his new book, Outnumbered, Outgunned, Undeterred: Twenty battles Against All Odds, which was published late last year. The examples in the book range across time and space from George Washington and the American Patriots at Yorktown in 1781, through to the Battle of Wanat in Afghanistan in 2008, via choices as diverse as the Greek War for Independence, the Battle of Warsaw in 1920 and the defence of the Golan Heights in Israel in 1973. The examples cover instances where the smaller and apparently weaker force has been on the offensive, and others where a last stand or defence has been taken; in some instances the underdog lives to fight another day, while in others there are incredible examples of whole groups of men being wiped out in a bid to protect others. Some of the stories are ones I was familiar with before reading this book, while others were entirely new to me, and I appreciated the diverse range of examples presented by Johnson in compiling this book. Each case study was presented in a short chapter supported by a battle plan and one picture to set the scene. Curiously, the battle plans were embedded in the text towards the end of each chapter, when I thought they would have been of more assistance to the reader placed at the beginning. Further illustration would have been appreciated, but as it was the battle plans were sufficient to help understand the layout of the areas in question and the actions of those involved. The writing was clear and competently written, and it is evident that Johnson has done his research and has a good understanding of the material. However, I found the text to be curiously flat and dispassionate in most places considering the obvious relish the author has for his subject matter. In some chapters – such as the French Foreign Legion at the Battle of Camerone – his enthusiasm for his topic and the respect he feels for the men who fought does start to come across and involve the reader in the story being told, but in so many other places I was left feeling a bit underwhelmed. These are incredible accounts of courage, and I think showing more of the human stories alongside the clever tactical manoeuvres would have created a book that had a bigger impact on the reader. For example, one of the chapters told of a heroic last stand that had just two survivors, yet the names and fates of these two men were not revealed. As a reader I would have been fascinated to know what happened to these two men – it would have added just one more paragraph to the chapter in question, yet left me much more satisfied as a reader. If some of the battle accounts left me a bit flat, then the final conclusion that sets out to answer Johnson’s initial questions was certainly worth reading. It neatly and coherently draws the previously twenty chapters together to provide a convincing argument – which I won’t spoil for you by revealing it here. I think this book is worth reading if you are new to this subject matter, although I suspect it has little to offer more experienced readers of military history. With thanks to Thames & Hudson for providing me with this review copy. 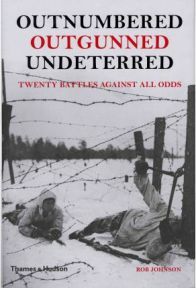 No Comments on "Outnumbered, Outgunned, Undeterred: Twenty Battles Against All Odds"